Till some time ago, Flash was the software of choice for creating videos and animations. However, over the period, it failed to keep pace with the constantly evolving technology. Rapid updates in Flash made it prone to crash. Besides, it could easily be misused by malware developers. Steve Jobs, the founder of Apple, withdrew support to Flash in its iOS platforms in 2012, given the numerous malfunctions that happened due to it. In fact, in one of his articles, he said, “new open standards created in the mobile era, such as HTML5, will win on mobile devices (and on PCs too)”. Though easily available, Flash was 100% proprietary. It was controlled by Adobe, which means that it was a closed system and only Adobe had authority for future enhancement or pricing. Given the factors going against it, the downfall of Flash began and HTML5 emerged as a reliable and secure option for L&D professionals. HTML5 is an open source technology that has been thoroughly tested, has no major issues, and finds the support of all major browsers. The increasing use of mobile devices has led to the creation of content that can be easily accessed on smartphones as well. HTML5 has made access to mobile learning (M-Learning) easy. The eLearning industry is fast shifting from Flash to HTML5 for M-Learning. Here are some more reasons prompting the shift. No additional plug-ins required: The previous versions of HTML relied upon third-party apps to play audio/video files. However, HTML5 includes media tags that allow developers to embed these files directly in the code. End-users do not require any additional plug-in to play the audio/video files, animations or graphics. Besides, HTML5 facilitates data storage, which can then be accessed offline. Supported by all major browsers: Flash does not find much support on mobile platforms, such as Apple mobile devices (iPhone and iPad) and Android mobile devices. 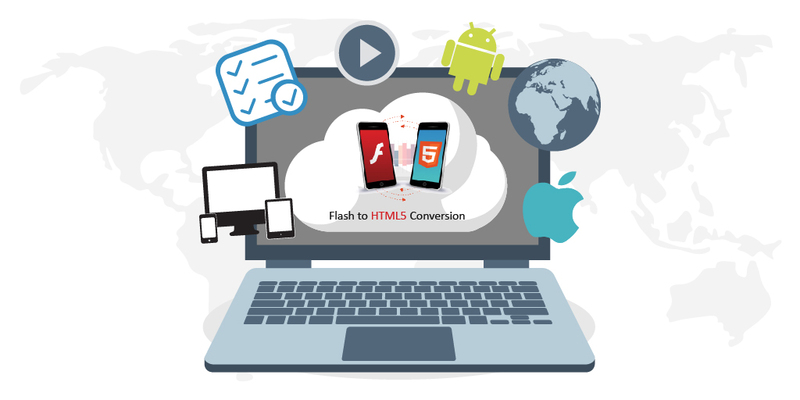 Since most organizations are using mobile devices and tablets to deliver their learning and training modules, they want their content to be compatible with these devices; so HTML5 is the answer and not Flash. Supported by multiple devices: We live in a multi-device world. We make constant switches from computers to laptops to smartphones in a day. Besides, the trend of BYOD (Bring your own device) is fast gaining ground, worldwide. A report from Gartner suggests that employers would soon require employees to bring their own devices for work. The company defines BYOD strategy as “an alternative strategy that allows employees, business partners, and other users to use a personally selected and purchased client device to execute enterprise applications and access data. It typically spans smartphones and tablets, but the strategy may also be used for PCs.” Given the rise in this trend, HTML5, supported by all major mobile platforms, is the way forward. Unlocking investment in legacy courses: Over the years, organizations have built their eLearning courses using Flash and other software. Since mobile devices do not support Flash, these courses are locked for desktop use. However, since learners today require multi-device access to their content, companies can unlock the value of their investments by converting the Flash courses to HTML5, and thus ensuring their access on mobile devices. Safeguarding your future investments: Needless to say, companies will not want to invest in courses based on old technologies. HTML5 is an open-source system, adopted by W3C, incorporated by all browsers, and accepted by multiple devices. Going forward, it is also expected to power the adoption and use of xAPI, gamification, and badges. This itself, builds a strong case for companies to shift from Flash to HTML5.